AS SEEN IN THE TIMES. Eat the foods that will help you live longer . . . THIS is the internationally bestselling, clinically tested, revolutionary AND straightforward diet to help you slow-down ageing, fight disease and lose weight. 'The diet that holds the key to staying young . . . Dr Valter Longo is now considered one of the most influential voices in the 'fasting movement' The Times 'Dr Valter Longo is one of the real scientific pioneers when it comes to researching the impact of food on health' Dr Michael Mosley, bestselling author of The Fast Diet and The Clever Guts Diet Following 30 years of research Professor Valter Longo - a biochemist and one of the world's leading researchers into ageing - has investigated genetics, nutrition and stem cells to discover that the secret of longevity lies in cellular regeneration triggered by a special diet. He is now able to reveal how, by adhering to his fasting-mimicking diet we heal ourselves through food. Dr Valter Longo's healthy, lifespan-extending programme is based on an easy-to-adopt lifetime plan, coupled with a fasting-mimicking diet 3-4 times a year, and just 5 days at a time, that gives all the health benefits of fasting without the hunger. 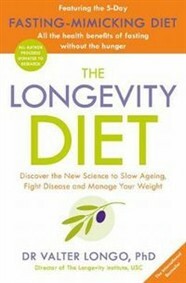 Including 30 easy recipes for an everyday diet based on Longo's Five Pillars of Longevity, The Longevity Diet is the key to living a longer, healthier and more fulfilled life. Try easy, plant-and-fish based recipes that use phenomenal, live-long ingredients . . . Great for the heart and rich in antioxidants: black rice with courgette and shrimp with a mixed green salad, sweet tomatoes and carrots drizzled in balsamic vinegar. For a good source of iron, snack on dark chocolate and yoghurt, and for dessert try tangy dried cranberries and walnuts. Make simple changes that can extend your healthy lifespan * Prevent age-related muscle and bone loss * Build your resistance to diabetes, cardiovascular disease, Alzheimer's and cancer * Maintain your ideal weight and reduce abdominal fat * Why rely on medication to cure illness, when you can help to prevent it altogether with your diet?